One of symbols of Kharkiv and its main attractions is the monument to the outstanding Ukrainian poet and writer, artist Taras Shevchenko. One of symbols of Kharkiv and its main attractions is the monument to the outstanding Ukrainian poet and writer, artist Taras Shevchenko. 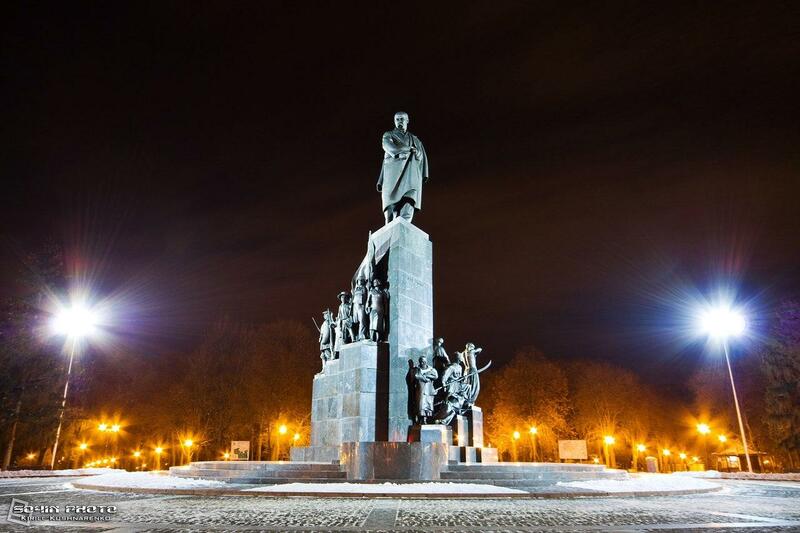 It is considered to be the best monument to Shevchenko in the world and this is one of the seven wonders of Kharkiv. The monument is located in the city center, in the garden that has the same name – Shevchenko Garden. Along with the landscape and Kharkiv architecture they form a unified ensemble. The total height of the monument is more than 16 meters, and the statue of Kobzar made of gray (originally black) labradorite is 4.5 meters. Since the opening celebration of the monument took place on March 24, 1935, the interpretation of the personality of Taras Shevchenko was Soviet (ie, as a revolutionary poet, writer, an ideological fighter for the bright future of the people). The style of sculpture is the combination of socialist realism and Stalinist Baroque. The authors of the monument are sculptor Matthew Manizer and architect Joseph Langbard. Unified multidisciplinary composition of the monument should be viewed in several stages. The monument is the original architectural spiral with triangular column with Shevchenko on a pedestal, around which there were placed in a circle 16 frozen in the movement statues, representing the working people in the fight for their rights and freedoms. The statue of Kobzar is full of dynamic. Laconic forms represent the style of constructivism. Exaggerated folds of clothing, work with large planes create the effect of power and fight. The sculptures surrounding the pedestal are made of dark bronze and are two times smaller than the figure of Shevchenko. According to author’s idea, this composition should be viewed from a small distance, starting with “Catherine” and then move counter-clockwise. Let’s divide all the figures into three sketches. The first is a collection of "rebellious" characters from T. Shevchenko’s works. This includes 'Kateryna’ from the poem with the same name (‘peasant with a baby’, symbolizing the image of a single mother), "Dying Gaydamak", "Gaydamak with a scythe," "Tearing shackles" from the poem "Haydamaky" telling about events of Cossack peasant uprising in 1768 in Right-Bank Ukraine, "Bound Zaporozhets," "Peasant Woman", "bearing a millstone," "soldier-recruit". The second figure includes participants of the Russian Revolution: "Worker with a flag", "Student", "Worker with a rifle," "Sailor," "Red Army soldier". The third represents the changes occurred after the revolutions in the Soviet Union: "The peasant," "Miner," "Woman with a book." And finally we have to mention that every year the number of Kharkovians is growing more and more. Why would we mentioned this, you may ask? The fact is that every visitor of the ensemble tries to find (and finds?) the hidden tractor wheel from first farms between the statues of the ensemble. They say that the one who is able to find the wheel will find his/her soul mate and remains in Kharkov permanently.